In Tariq El Jdide, 62 families were already evicted and 98 families were threatened with eviction. Propelled by real estate market forces, lack of governance, and high unemployment rate, eviction is one of the endemic urban problems of Beirut. How can evicted people with limited amount of compensation stay in the city with adequate and sustainable housing? The project presents two possible scenarios. Both of them deploy the idea of providing only the bare necessary living areas in order to minimize costs and maximize future possibilities. The first attempt aims to provide affordable options that allow current residents to stay in the same building. The second proposes a typology that could become a model for the entire city. By pooling eviction compensation and funds from other willing parties, a new building close to the former one solves the emergency need of housing and allows further adaptations. The first scheme refers to the existing building where almost 15 evictions took place. The majority of the above cases concerns single tenants who used to rent the apartments and they are not able anymore to afford the rents. The first concern is to provide affordable options that allow people to continue living in the same location. A refurbishment and rearrangement of the deprived part of the building could provide double the number of apartments. Whereas the front building keeps the price of the rent market. The modest addition will increase property value and generate more profit. However, there will be a rent control to ensure affordable rents. The designed apartments offer comparatively smaller residences with loggias. Despite the limited size of the rooms, the tenants profit by the low rent, the use of communal spaces such as kitchen, working areas, laundry and the potential to expand their dwellings in the future. Community life can happen in the additional loggias, and foster a relationship between original habitants and relocated people. The new typology proposes affordable housing that could become a model for the entire city. This case is about the relocation of the evicted population in a new building close to the old one. Plots that are considerably small and underprivileged in terms of probable development are being selected. A group of evicted people willing to invest their compensations in collaboration with local politician or religious groups and community charities participate in that project. Both of them will own a share in the cooperative . The above strategy gives economic opportunity to the less privileged to own a residence. 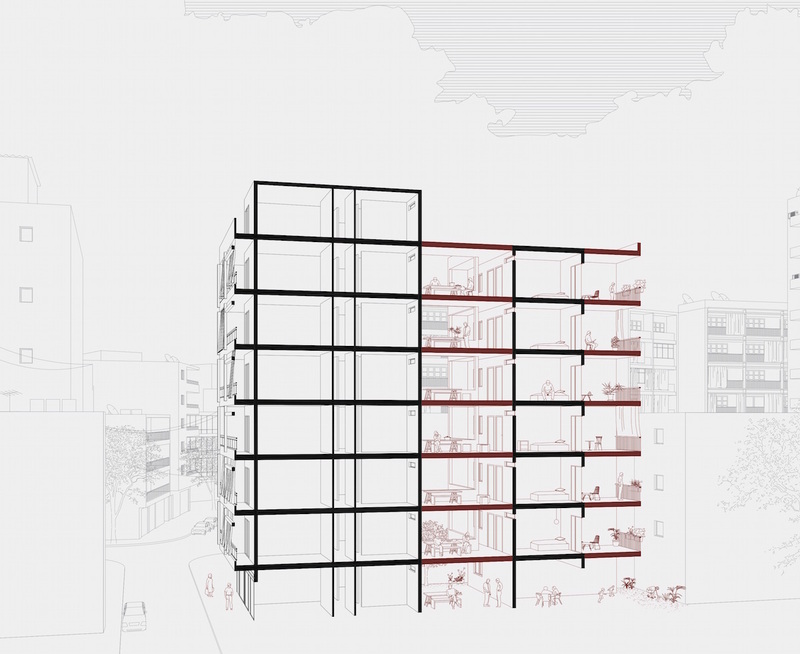 Minimum space typologies solve the emergency need of housing and allows further adaptations. A flexible core of bedrooms with bathrooms can be extended by habitants. The loggias also in that case can be inhabited and developed in a freeway according to their needs. The new owners personalize the space and add value to the entire building with their extensions. The ground and the first floor offer more public activities. The open plan of the ground floor hosts pop-up markets and events and the first floor enables welcoming public spaces. The aim of the new typology is to embrace collective activities and the interaction of new residents in an ongoing project. Loggia can be freely appropriated. Habitants can personalize their area by adding partitions, curtains, or extending their rooms. The new typology of bare necessary built areas can be built on small plots. Loggias connected to each side of the rooms serve different needs for privacy. The two attempts intend to encourage minimum and cost-saving planning in a way that can be modified so as to serve the community’s needs. The necessity of housing requires design incentives and efforts to provide conscious propositions.